Lil' Bits "Bear Academy" is full of more unique elements, wordart, and wordtags that have already been completed for you. Now we're not doing your homework for you, just helping a little! 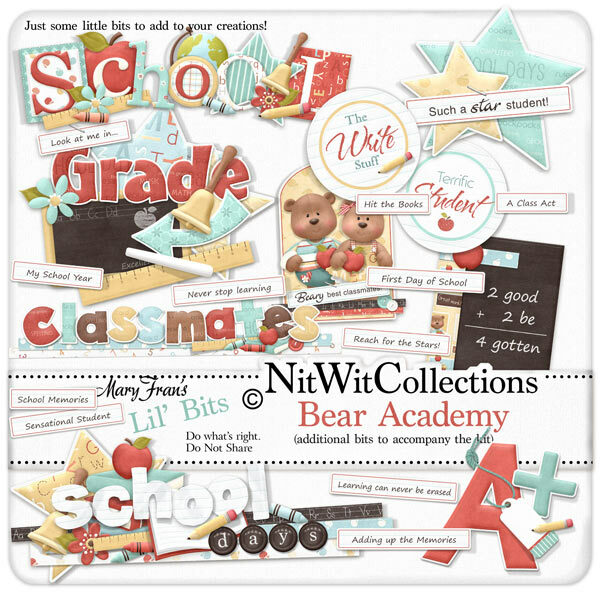 These digital elements are NOT included in the FQB "Bear Academy" Collection so don't pass these by! 1 Circle element - "Terrific Student"
1 Circle element - "The Write Stuff"
1 Word Art - "2 Good 2 Be 4 Gotten"
1 Word art - "A+"
1 Word art - "Beary Best Classmates"
1 Word art - "Classmates"
1 Word art - "Look at Me in Grade.....(you fill in the number)"
1 Word art - "School"
1 Word art - "School Days"
1 Word art - "Such a Star Student"